I just released version 0.3.1 of Tetringo for the Linux desktop and for the Nokia 770. It’s still only single-player, but it works well and plays wonderfully on the Nokia 770. This is actually the second release of the night, and features an all-new shiny Quit button! And some rendering speed-ups and reduced file size. TuxPaint for the Nokia 770 – Packages! You need to install SDL_ttf and SDL_image from the Maemo Library Catalog page first, and then grab the tuxpaint deb. This will be on the Application Catalog shortly. Tux Paint is one of those Linux applications that just makes me smile. It’s cute, fun, and great for kids. My little sister of five years old loves it and has been playing it since she was two. Also, Bill Kendrick, Tux Paint’s creator and lead developer, is a friend of mine, but I’m not biased at all! 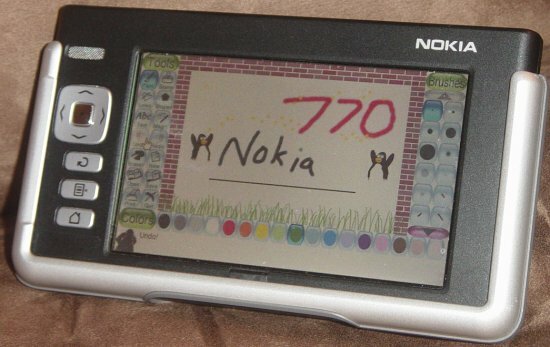 So recently, Bill has been talking about finding somebody to port Tux Paint to the Nokia 770. Since I have one, and since my sister loves playing with both the 770 and Tux Paint, I figured I would take up the challenge. While not perfect, and somewhat slow in loading, the end result turned out pretty good. Work will continue on this. Some optimizations need to be made in areas, and hopefully other users of both Tux Paint and the 770 will want to contribute. Releases will be posted soonish. I was cuddling up with my girlfriend tonight and we decided to look up some info on the net that we were talking about. The problem was that my laptop was inconveniently out of reach, and would require us to go outside into the cold and leave the nice warm room. It was then that I realized that my Nokia 770 was sitting in my coat pocket. I pulled it out and fired up the web browser, and soon we were Googling our way to knowledge. It was so convenient that I think for the first time it just really made me realize the potential of this type of device. While looking at the pages, we decided to jump back to the Home screen and stream some nice classical music, which we left on for the next hour or so. The only problem we ran into was that some sites were popping up ads in other windows, which at times stole the focus and also slowed down the browser a bit. There may be a popup blocking feature, but I haven’t looked yet. Anyhow, we were both pretty happy with the convenience of this. No need to go out into the cold to fetch the laptop, and more time to spend with each other in the warmth.